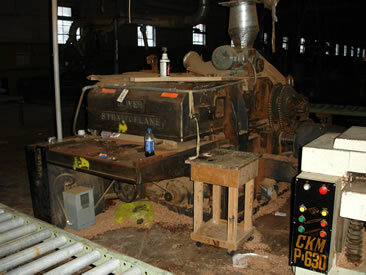 On January 29th, 2008, Joe R. Pyle hosted the liquidation of Cherry Valley Furniture in Richwood, West Virginia The shop consisted of a variety of machinery ranging in age from the early 1900’s to 2004. 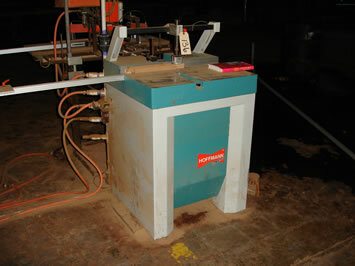 The plant had been shuttered for approximately two years before the auction took place. 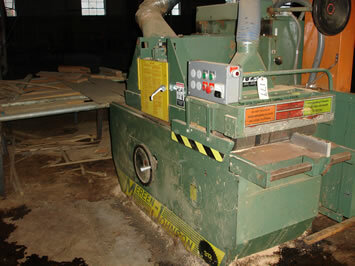 The sale was ordered by the “usda” who was the lienholder on all of the machinery and the building. The plant was extremely dirty. It looked like the the floors were never swept. 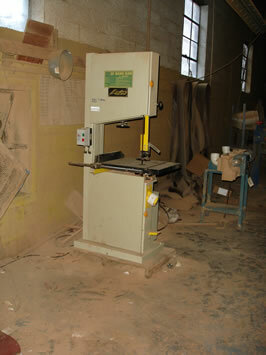 There were heaps of scrap wood and sawdust mixed with garbage everywhere. 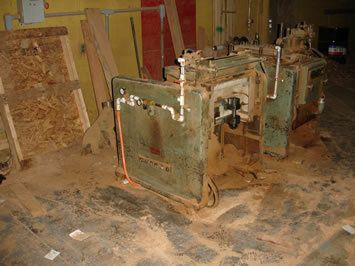 The roof had been leaking, so there were pools of water around most of the machines. I had arrived early for the sale. It was still pretty dark and the power had been disconnected. That meant I had to find my way around the mess in the dark. The first order of business was checking out the forklift. A friend had asked me to look it over, and I knew that I’d need it at the end of the day for the load out. It had a dead battery, but once we jumped it it started right up. The machine had been abused, but it ran good and everything worked pretty well. One of the handlers with the auction company came over and started talking about the sale. He told me that the forklift had disappeared from the plant a few weeks earlier. When they started asking around town, they discovered that the workers from the town garage had come over and taken it to their shop. The explanation they gave was that “nobody was using it, and they had a big truck to unload”. The lift had only been returned the day before the auction. 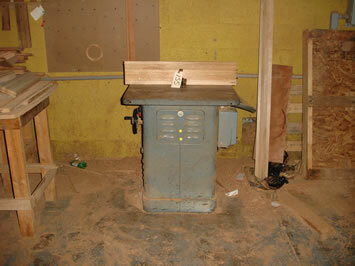 He also mentioned that there had been a break-in a few days earlier and all of the hand and power tools had been taken. 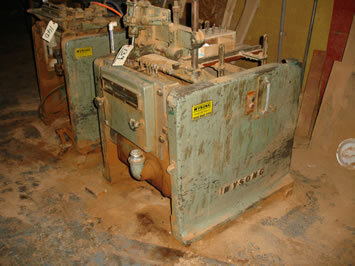 The theives also took the wood fired boiler. 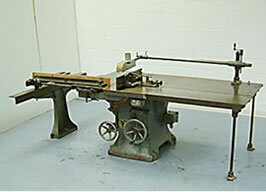 My primary interest in the sale were a pair of Wysong dovetailers, a Hoffmann joinery machine and a Mereen Johnson gang rip saw. The Wysong dovetailers were a big disappointment. One was complete and worked great. 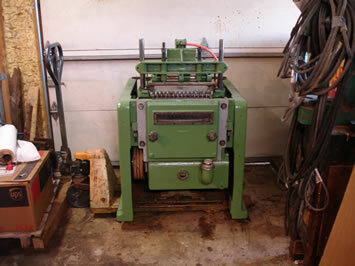 The other one had no gearbox or spindle housing. I could see that it had just been removed. I did a quick pass around the plant and found the missing parts laying in a corner of the spray booth. I put them on a cart and dragged them back to the machine. It looked like it was all there, but I couldn’t really tell. The Hoffmann was pretty dirty, but all there and no visible damage. The Mereen Johnson gang rip was really sad. 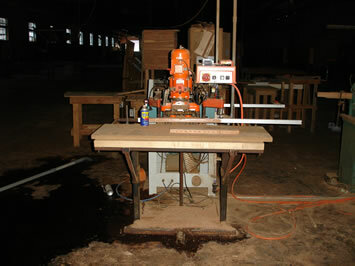 It was a late model machine, but a leak in the roof had allowed water to run down the dust pipe into the saw. The kickback fingers were rusted solid and the arbor wouldn’t move. There was a piece of wood stuck in the feed rolls. It was soaked and caked up with with sawdust. On the other end of the spectrum was this Oliver Strait-O-Plane. It sold for $10 to the scrap guy. I thought about buying it just for the heads, but the gibs were missing. It was pretty sad anyway. This unknown mortiser brought $100. I was initially interested, but upon close inspection, I realized that the base had been completely cut off and welded to a steel plate. It was a real mess. The guy that did buy it spent a good hour just breaking the plate loose from the floor. 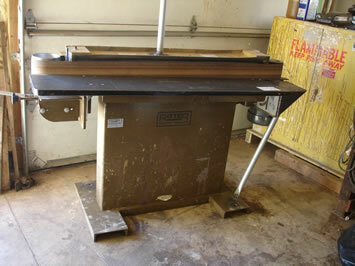 I ended up buying a Blum Mini Press for $100, The Hoffmann dovetail machine for $700, a Ritter edge sander for $175, A Woods 808 Moulder with the frequency changer for $100, and the pair of Wysong dovetailers for $75. 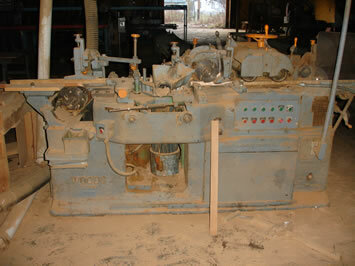 I bid on the Mereen Johnson Gang Rip Saw, but stopped at $4500. 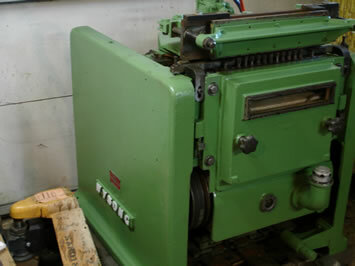 It ended up selling to a mid-west machinery dealer. The Forklift sold for $6500. It was an OK machine, but I never expected it to go that high. 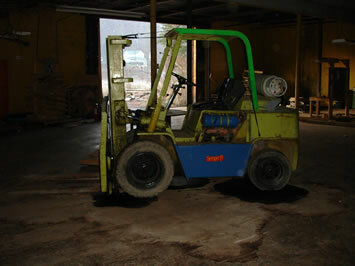 After the auction ended, we went to start the forklift only to find that it had been sabotaged during the auction. somebody got under the hood and ripped a bunch of wires out. They also stole the coil wire. We managed to come up with a new coil wire and I managed to figure out where most of the missing wires had gone. We could get the lift to run, but it would flood out after a few minutes and wouldn’t start again. This presented a big problem since everyone had intended to load out using that lift. 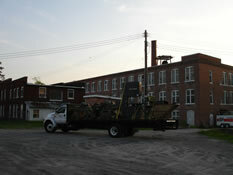 The auctioneer went to a machine shop down the street and talked the owner into loading a few of us out. He couldn’t do it for a few hours, so there was a bunch of waiting around. 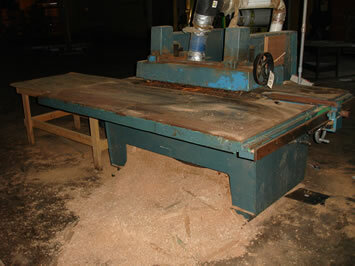 The scrap guy decided he didn’t want to wait, so he brought his truck into the building and backed it up to a big old drum sander he had bought. His truck was a 1970’s F-350 with a homemade sheet metal flatbed. It had a big winch up in the front of the bed. He hooked his cable onto the top of the sander and started to pull. Once the sander was up against the bed, it wouldn’t move. So he put the truck in gear and jerked it forward. The sander toppled over and landed on the edge of the bed. The front of the truck shot up in the air and struck a few sets of fluorescent lights. The lights broke loose from the ceiling and rained glass everywhere. I saw this happen from about 20 feet away, and what really struck me was that none of the other people in the building missed a beat. They just kept doing their thing and most didn’t even turn their heads. It took three hours for the lift to arrive, so I ended up getting loaded in the dark. The guy from the machine shop was good, so I got on the road without incident. 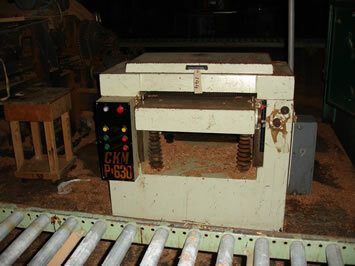 With the two Wysong machines and the Woods moulder on the trailer, I was overweight. This made for a very long trip up out of the mountains. I ended up scrapping the woods moulder. 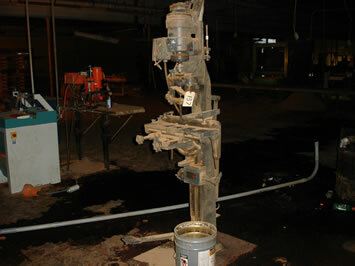 It had a bad bearing on one cutterhead and it was only a 4″ machine. It brought $800 at my local scrap yard. 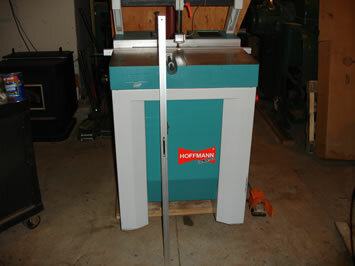 The Hoffman cleaned up nicely and turned out to be a great little machine. 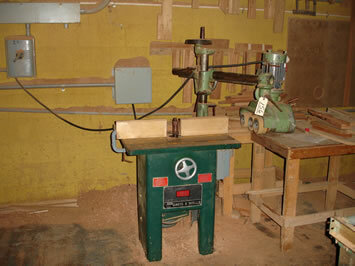 The two Wysong Dovetailers took some work, but also turned out to be very nice machines.